Marketing is one of the areas of business which people seem to spend the most time on. It’s also the area of business people seem to have the most frustrations about. 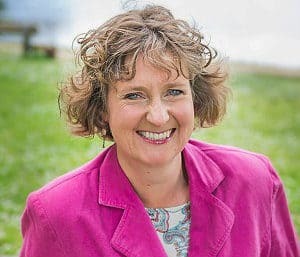 It’s the topic which comes up time and again in coaching calls with business owners, and the area they feel most ‘stuck’. Why do we get stuck on marketing, when it should be the simplest thing to do? So, it’s simple right? It’s the ACTION of promoting and selling. OK, market research and advertising are in there too, but that’s part of taking action and understanding the audience you’re promoting to. So, if marketing is simple, why do business owners get so confused and hung up on marketing? I believe it’s because the places available to us to promote and sell our products and services have increased 100 fold, (maybe more? ), over the past 20 years. Our lives seem more complicated with communication technology, not less complicated as we may expect. Our attention span has reduced. Any promoting and selling has to happen in a smaller time frame than our ancestors had. Many of our clients seem to tie themselves in knots about whether to use twitter or instagram; or how many emails should they send to their customers each month; or they spend hours making a web page look stunning, but then forget to add a link to that page on any of their social media posts. Well, that may well be the topic of a discussion we can have one day. However, for now, I’d like to suggest that marketing is an industry. Even our children understand on some basic level that they are “being marketed to”, and being shown what life will be like when I purchase this sparkly new product. Some advertisements may be considered art, whether they are video format, or flat images. There are advertising and marketing awards each year. (I think I’m straying into advertising here, but it’s in our dictionary definition, so please forgive me for putting both terms in the mixing pot). I guess what I’m trying to say, is, does it matter if marketing is an art or not? If you have a product or service you need to sell to generate some income in your business. Then you need to market/promote it to your ideal client, otherwise, you’ll have no business. When we work with clients, we always like to keep things simple, and marketing is no exception. If it’s not simple in your business, it’s unlikely to happen, or happen well. Agree? So to keep marketing simple what do you need to do? How much time do you have each week to market your business? Knowing how much time you have for this part of your business, helps you then to really get to know what’s achievable in the time you have. Do you have other people who can help you, or who’s job it is to help you with marketing? If you don’t have time yourself, can you pay someone else to help you? If so, how much? What’s worked in the past? Do it again. Don’t ever think that because you’ve done something that worked once, that your customers will be bored with it next time you do something similar. A lot of businesses can only grow if they get new customers, so you’ll be constantly marketing to new customers. 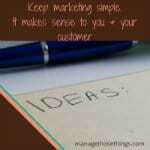 Keep marketing simple by repeating what works for your ideal customer. What do you enjoy doing, (that gets results)? If you enjoy doing something, your tone, and manner when you’re marketing is likely to be more natural than when you do something that’s uncomfortable for you. If you enjoy chatting with people in Facebook groups, and you get customers from those places, do more of it. Spend your time doing things you enjoy. If you enjoy blogging, and that’s getting more traffic to your website, which in turn is increasing sales, then do more of that. What’s right for your business? This may be related to where your customer hangs out, but not always. What’s right for your friend in the networking group, may not be right for you, or your business. It’s not always about breaking through our comfort zone in life and business to get growth. A lot of time, it’s about understanding what’s right, and will work for us. You’ll notice we haven’t talked about Facebook ads, needing to post 6 times a day on twitter, or spending time making connections on LinkedIn. They may be part of your marketing mix (remember? Product, Price, Promotion and Place, with Promotion being where you promote your product), but it won’t work for all businesses or business owners. What should I do to keep marketing simple in my business?